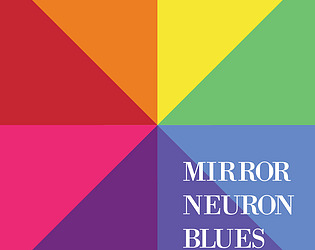 Mirror Neuron Blues is a cooperative screenless Leap Motion/Arduino game. The game requires a Leap Motion controller and a "light board," a custom rig of 25 RGB LED Pixel lights controlled by an Arduino and affixed to a board (in this case) that stands on the table. There is a large hole in the board, so the players can see each other, and the lights are affixed in a ring around the board and are visible only on one side. The two players sit opposite each other, with the board in between them. One player, the "musician", has the Leap in front of them. The other player is the "conductor", and they have the lights on the board facing them. The lights aren't visible to the musician. The game progresses in rounds. A sequence of light patterns will appear on the light board. The conductor traces the light as best as they can, while the musician mirrors the conductor's movements and gestures. If the movement/gesture sequence is correct, music will play as the musician's movements are detected by the Leap. If the sequence is correct, the players progress to the next more difficult sequence.